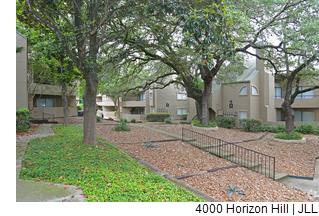 ​​​​ SAN ANTONIO – REEP Equity purchased two 1980s-era apartment complexes near the Medical Center. The properties, 4000 Horizon Hill and Northgate Village, were previously owned by Nilayam Jaya Lakshmi LP and Pallavi Limited Partnership, which share the same Houston address. The 4000 Horizon Hill complex features 273 units, three swimming pools, and an on-site fitness center with immediate access to I-10 and I-410. Northgate Village, at 5700 North Knoll, consists of 264 units, a swimming pool, and picnic area. Each property offers similar rents, starting at about $660 a month for a one-bedroom apartment and maxing out at just over $1,000 a month for a two-bedroom. ​​Check out San Antonio-New Braunfels Multifamily Market Research​.